The plush padding of the Baby Papasan Infant Seat contours to baby for soft, cuddly support of the head, neck and sides. It surrounds baby in complete comfort, with luxurious fabrics in rich textures that also offer baby tactile variety. There's also and adjustable infant head support and removable infant body pillow to keep your newborn extra comfortable. The removable mobile has a mirror that swings away (for easy access to baby) and a hanging bunny toy to keep baby entertained. You can switch on calming vibrations, music (it plays 8 soothing songs), or both. This seat is so soft, so cozy, you'll love putting baby in it! 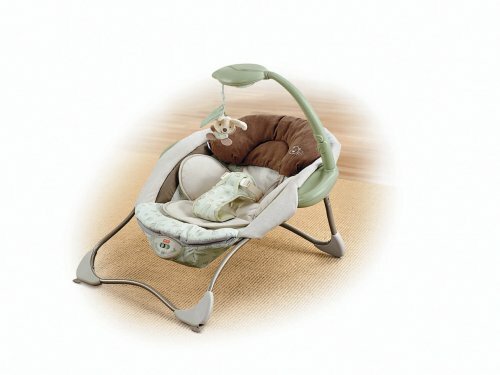 The Baby Papasan Infant Seat is a deluxe infant seat that snuggles baby in natural looking soft and cushy fabrics. There is an infant insert in a soft quilted microsuede that supports baby's sides and a microsuede pillow to cradle baby's head. Overhead, baby has an adjustable mirror dome to look at, and a sweet plush mouse dangles to entertain. There is mom's favorite - vibrations, and beautiful classical music plus lullabies, 10 songs in all. The music plays for 15 minutes continuously, and Mom has volume adjustment or she can turn the music off if she likes. The music plays for 15 minutes continuously, and Mom has volume adjustment or she can turn the music off if she likes. My baby really never liked sitting in this chair. Always squirming, wants to get out -- this is from 1 month up to 4 months (as he is today... can't evaluate beyond 4 mos.) He doesn't appreciate the vibrate, nor the music that much. It's too firm to bounce appreciably (find something with 2 legs in front, none in back) Compare to a Baby Einstein mat placed on the floor, which simply captivates him and has him staring up at the blinking lights... although that's comparing apples to oranges, chalk to cheese. The one thing that shocked me about this chair, was that the "music" option features the song "All Through the Night" which is a religious song. Now, it is a beautiful song, but come on, do you think America simply has no atheists, agnostics, Hindus, Jews, Moslems, Buddhists, etc., that you could slip in a little Christian music there and think no one at all will mind? Honestly, could you imagine a company thinking it would be appropriate to spring on unsuspecting buyers baby music that was actually "L'internationale" the communist anthem, or "Hava Nagila", or "Dixie" or the theme song for Greenpeace or the NRA or something specific like that? It's just not right from a business point of view -- aimed at a general buying public, you should not do something tailored and specific to a subset market. What were they thinking? We received this as a baby shower gift. For the first two months it was fine. But my son soon outgrew it. He was only 6 lbs at birth and is still within the weight requirements, however, his feet now hang over the edge of the seat. (he is 3 and a half months now) He does like looking in the mirror but gets bored fast. We bought Fisher-Price Playful Puppy Bouncer for 'grandma's' house and my son LOVES it. It will fit him for months to come and it entertains him. It was cheaper when we ordered it directly from fisher price. My baby LOVES to sleep in his infant seat. It's cozy and warm, with lots of fleece and a big comfy pillow for his head. He cries if he can't sit in his seat, for instance if it is in the washer. The seat washes well, doesn't shrink and stays colorful. (We have the Nature's Wonder version that we bought on sale at Amazon for $37.00.) It's evenly balanced without worry of tipping and can be carried from room to room. There is a harness to keep baby strapped in when moving him. It plays music, vibrates and has a toy mirror and a butterfly toy instead of a bunny. He doesn't really use these features much. This is the most useful baby item we bought! A New Baby MUST HAVE! Highlights include soft and cushy fabrics to cuddle your baby (including a micro suede pillow for baby's head) and this chair VIBRATES!!! (That has to be the best feature) It also plays soothing music, either classic or lullaby (10 songs in all). The music plays continuously for 15 minutes and there is a volume adjustment.